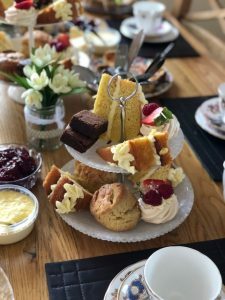 If you’re looking for catering for a birthday party or event, corporate catering for a business lunch or a vintage afternoon tea at home, Laura Fox Catering can provide the perfect food to make your event extra special. Delivering to those in West Yorkshire, Leeds and the surrounding areas we take pride in our food – all our sandwiches, cakes and savoury treats are homemade in our kitchen, freshly for your event. ****Easter sweet treats**** now available to order. The corporate logo cupcakes have gone down a storm in the office. They are lovely! Thank you so much for your work on them, and I hope we have another excuse to order from you soon. Laura Fox Catering catered for our corporate open day event. The selection and quality was evident from the outset, as was the incredible value for money. Laura did a superb job feeding all our guests, all of which commented on the superb quality and abundance of choice! Excellent service even with the short notice I gave! I could not have been happier with the outcome. Thank you. Just to say thank you for the lovely food you provided. Everyone said how delicious it was and the desserts in particular were very well received! Thank you again. I wouldn’t hesitate to recommend you. Thank you for the delicious food you provided for my Dad’s funeral. From the moment we first contacted you, your professionalism put us at ease that we’d made the right choice. You've been superb and we would highly recommend your services to anyone. Thank you for the catering, there was plenty of food and everyone really enjoyed it! I'll be recommending you for future events at the University. Delicious food supplied for our Christmas party - would recommend to everyone! Thank you so much for doing the catering for our party. The food was fantastic & alll our guests commented on how nice it was. The children's lunch boxes were a great idea - they came back to entirely empty, so worked better than a buffet. The kids left well fed and said the cupcakes were amazing! Thank you! 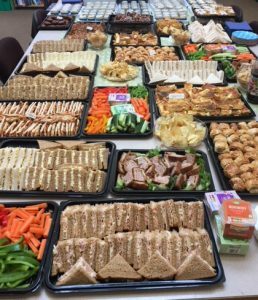 Thanks again for the business lunch catering– everyone really enjoyed the food and your assistance was much appreciated. 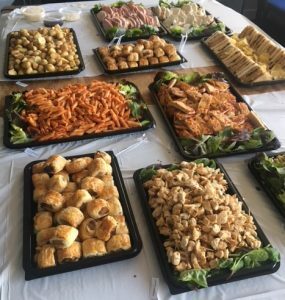 Thank you for the funeral catering on Wednesday, the food was lovely and everyone commented on how well it was presented. The party was a great success thanks to you, your wonderful afternoon tea and the service you provided. Thank you for providing the event catering – it was massively appreciated you did this at short notice and the feedback on the quality & quantity of food has been fantastic! Thank so much for the christening catering.. the wonderful sarnies, kids food & that cake...it was spectacular - I couldn’t stop eating it! Absolutely wonderful. Thank you again for the absolutely wonderful afternoon tea for my mum's 90th birthday. Everyone had a fantastic time and they are still raving about the food and the presentation! Laura made some fantastic Baby Shower Cupcakes. Gave her little direction & she came up with the most amazing, delicious cupcakes! Will definitely be using her again for any future events! Just wanted to say thank you for catering for us today. The food went down really well! Everybody complimented on the variety and quality of the food and the presentation. Will definitely be in touch next time we require catering. You did a great job with the afternoon tea party Laura - thank you. The table looked great and the food was delicious!